A new home often comes with a new lawn. Caring for that lawn might be more tricky than you may think. More people these days live in apartments and rental homes for a while before getting a house. Teenage chores probably happened longer ago that you want to admit, and besides, you might not have known all the proper tricks back then. 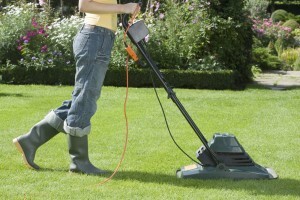 But learning a few basic guidelines can make mowing easier, and improve the quality of your lawn at the same time. The rule of thumb is that you don’t want to cut grass more than ⅓ of its length. This is usually achieved by setting your mower to its maximum height off the ground. The lawn might be a bit taller than you expected, but mowing only part of the grass helps minimize shock. Also, a taller lawn has healthier roots and can slow down evaporation of water and also keep weeds from getting enough sunlight to grow. You’ll want to let grass grow even taller if it’s usually shaded, such as the grass around a tree or sides of the house. As long as it won’t bother your neighbors, you might be tempted to mow early in the day before the summer heat hits. But that’s a mistake; mowing when the grass is wet can increase shock and hurt the blades, and also make your lawn look uneven. Mowing in the middle of the day, during the worst heat, will also damage the lawn due to shock, and is deeply unpleasant and, depending on the temperature, dangerous for you. So mow in the early evening, as the day’s heat fades and there’s still some light to see by. It’s also easier to spread the clippings evenly if they’re dry rather than wet. And obviously, never mow right after it rains or you’ve watered the lawn. It’s easy to fall into the habit of mowing the same day every week, and fall into the same pattern of where you mow. But grass will start growing in the direction that you mow, leading to uneven trim and taller grass (which remember, means healthier roots). You’ll also avoid ruts in the ground by changing your direction of mowing. Also, you should only mow when the grass needs it–don’t overcut it by mowing too often in summer heat, or undercut during spring growth. Learn to gauge how tall the grass should be to stay healthy, by asking at your lawn and garden store for the type of grass you have, and keep it close to that height. There’s a reason so many people talk about mulching and composting bags of grass, but it’s easier to just let them fly from the mower to the lawn. The grass breaks down quickly, as long as it’s not coming out in clumps due to mowing tall grass too short or mowing wet grass. Spread evenly enough, the clippings will break down and return nutrients to the soil. There are several things to keep in mind while mowing. First, make sure you’re wearing closed-toe shoes and some kind of eye protections. Jeans and a shirt are also a good idea, although obviously you have to consider your own tolerance for the heat. Sunscreen is also smart, even when mowing at twilight. Also, never try to push the mower uphill–go along the sides of a tall slope. Keep the mower in good shape, by checking the motor, how sharp the blades are, and keeping gas in it so you don’t need to refuel in the middle of mowing. And check the yard for rocks, big branches, or other debris that might fly out and smack you while you’re working.